CPE raises funds for Canucks For Kids Fund (CFKF) through the sale of their Canucks branded dB Blocker™ hearing protectors. Custom Protect Ear (CPE) will donate $5 to CFKF from every sale of their Canucks-branded dB Blocker™. The Canucks for Kids Fund dedicates resources to assist charities which support children’s health and wellness, foster the development of grassroots hockey, and facilitate and encourage education in British Columbia. 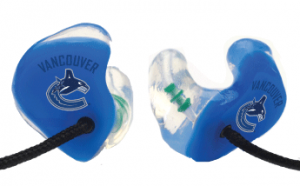 CPE also supplies the Vancouver Canucks with hearing Protectors for use by the Canucks NHL and AHL players and members of their management. As North America’s largest personalized industrial hearing protector manufacturer, hearing conservation is CPE’s only business. In every workplace, sporting, entertainment or home environment CPE helps protect you from noise induced hearing loss. To get Canucks-branded dB Blockers™ contact us today! For more information regarding dB Cares™, or how we both might become better partners in cause related initiatives, call or email us.